These cakes were eaten on the first three days of the new year. The custom goes way back to the court of the Heian period. Eaten at the Imperial Court. The Kyoto rice cakes express the change of the seasons and also the spirit of the people, living in Kyoto. For the New Year in Kyoto people made Japanese cakes with a happy color and shape. 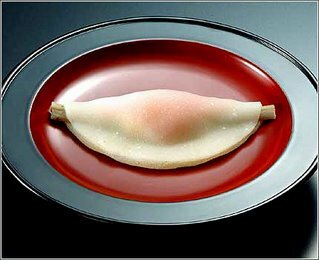 'Hanabira-mochi' (flower petal cakes) , also called 'Hishi-hanabira'(Diamond petal cakes), are cakes for celebration, consisting of burdock, soybean powder and bean jam. It is said that they were used in the New Year's day ceremony of the Imperial court, called 'O-hagatame'(teeth strenghtening). A bright red rice cake in the shape of diamond is placed inside a transparent white rice cake as to be slightly visible, expressing that there is a dignity inside the elegance and grace. Strengthening the teeth, a job for babies !
. Deities to heal your toothache . 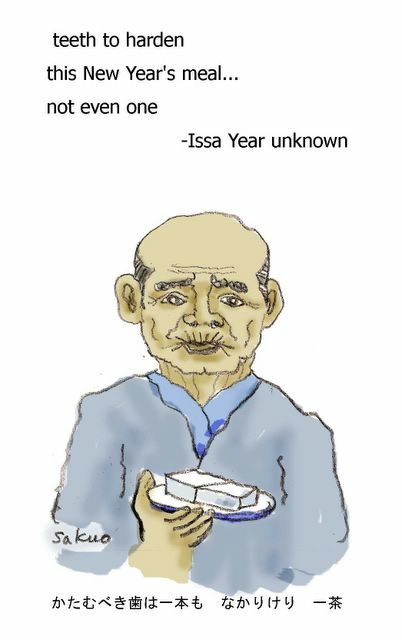 The sorry state of Issa's teeth is magnified by the fact that an old man has a more complete set. The "for me" has been added. Issa is referring to the New Year's tooth-hardening meal. He (or someone) is toothless and so must resort to tofu for the occasion. Issa has lost his last tooth on June 1811, at the age of 49. The last tooth has been lost at Futtsu. Issa wrote this haiku sneering at himself. in a freezing night . . .
. WKD : Body Parts and Haiku .
. Laver seaweed (nori 海苔) . ***** . 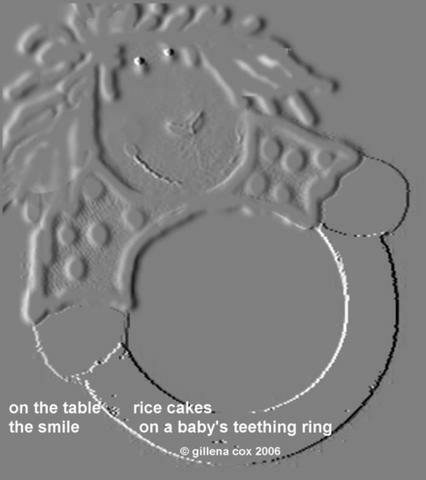 Deantist Haiku . Suddenly the funny face of Issa appeared on Gabi's page. I have perfectly full tooth. I know a great master of dentist in my neighborhood. Gabi san, thank you a lot. Many thanks to YOU, Sakuo san! 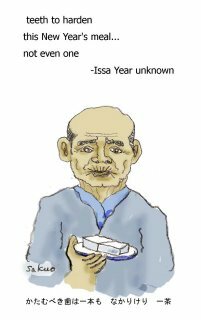 Laura Bell, from Higginson's "Haiku World"
Issa became toothless in 1811, the year before he moved back to his hometown to live. At the time he was forty-eight by western counting. This hokku appears in a collection of posthumously collected works edited by Issa's follower Kijo, so it comes from sometime late in Issa's life, when he was completely without teeth, although, as he wrote in one hokku, his gums were as good as anyone's. Tooth-Hardening is the name of a ceremonial meal that was usually eaten on one of the first three days of the lunar new year and sometimes again in the sixth lunar month. Food such as hard, round rice cakes, large daikon radishes, salted sweetfish, Citrus tachibana, and sour oranges were served, since chewing them was believed to harden people's teeth. And hardening the teeth was believed to contribute to longevity, so the meal was also a prayer for long life. Issa seems to have been holding a playful contest with his cat to see who could eat the most tooth-hardening food, and the cat has clearly won. Issa's laugh, however, is still in excellent condition, and it must have begun before the meal even started.